Current Builders has received recognition and awards for accomplishments throughout the construction industry and business community. 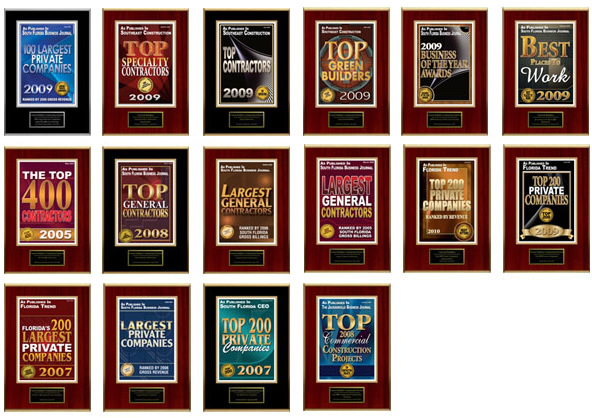 Our reputation for superior service, volume of work, continued growth and as an excellent place of employment is recognized annually by Engineering News Record, Southeast Construction News, South Florida Business Journal and the Sun-Sentinel, to name a few. CHASE White Level Partnership with OSHA and AGC. CHASE Red Level Partnership with OSHA and AGC. -- 2006 - Charles P. Reid, CEO, receives Distinguished Builder Award. -- 2006 - Reid inducted into the BCN Hall of Fame.